Back in September 2009 Dorota and I visited Trial Bay Gaol when we booked a weekend away to dive Fish Rock Cave at South West Rocks. 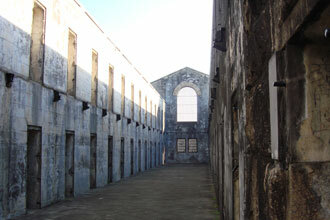 Laggers point provides a dramatic setting for Trial Bay Gaol (Jail). It is the only example of a station prison specifically constructed to carry out a public work. Built from exceptionally hard local granite from the nearby hill, it created many construction problems. The construction of the seawall by prison labor, and object of the public work, was never completed. Many of the original buildings at the prison no longer exist. Prior to 1900 three timber huts were used to accommodate some of the more trustworthy prisoners. You can still see the ruins of the hospital block and silent cells which troublesome prisoners were isolated. There are also remains of a building which housed light electric machinery, shoe smith, bathrooms and the bakehouse and kitchen. Washrooms, a watershed, six water tanks, a store, and a former underground water storage tank no longer exist. The water storage tank used to be 35 feet long, 25 feet wide and 18 feet deep, which held 37,700 gallons of water. Both the Public works era and enemy alien era cells have been restored, and also the North Western Guard’s watch tower which gives you amazing views over the bay. A plan was devised in 1861 to build a breakwater off Laggers Point to create a harbor for ships which were too big to cross the Macleay River mouths. 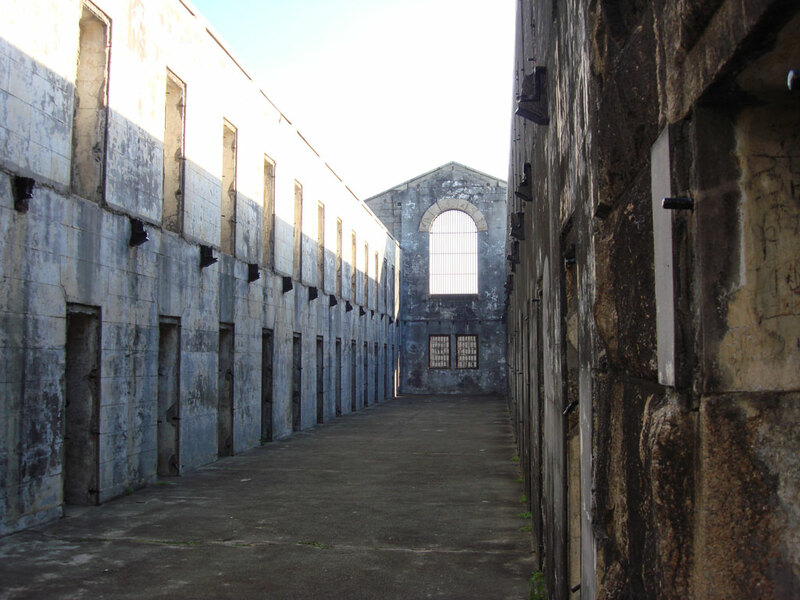 It was planned to use prison inmates for the construction of the breakwater, hence Trial Bay Jail was established specifically for the purpose of housing the workers, and became a Public Works Prison. Work on the prison started in 1877, and 64 cells were completed in 1886 when the first prisoners occupied. The breakwater the prisoners were to build was supposed to go out 1,500 metres out into the bay. Over the years of construction strong winds frequently damaged the breakwater. Between the years of 1898-1899 a second wing (South) and a junction between the second wing and the older section of the prison was added to Trial Bay Jail, which suggested the breakwater work was going to continue. Alterations in 1900 were completed creating a kitchen, bakehouse and scullery. Apparently the prison was costly to run and also at this time the government was rethinking their penology ideas and didn’t believe this type of work was an appropriate treatment regime, decided to abandon the project in 1903. Only around 300 meters of Laggers point breakwater was built, which shoaled up the bay and made it very shallow for ships. A wharf was then built in 1898 within the breakwater to be used by passenger ships which couldn’t cross the Macleay River’s mouth. Nowadays none of the wharf is visible, and only a very small section of the breakwater exists, around a 50m length. The last use of the prison was between 1915-1918 when it was used as an enemy alien internment camp. Most of the detainees at this time were officers from the German Army Reserve. In 1917 It was rumoured that the Germans planned to rescue these men. When in 1918 an armed merchant raider the German Hilfskreuzer SMS Wolf was seen all the men from the prison were relocated to a larger prison on the outskirts of Sydney. It was dormant for several years and was completely stripped of fixtures in 1922. Today Trial Bay prison is open to the public 7 days a week from 0900-1630 and operated within Arakoon State Conservation Area, a heritage site by the National Parks and Wildlife Service. It also provides thousands of visitors yearly with facilities for camping, swimming, boating, fishing and scenic walks. Given the origin of Australia’s first settlers I can imagine this place was pretty much in demand back in Victorian times! !